By Horizon Video Technologies Inc. I usually put off writing reviews until the weekend when I have time for them. However, this new app called Horizon came out today and I simply can’t wait to review it. Basically this app sets out to fix those pesky vertical videos that people always put up on the internet. Vertical videos happen when people hold their videos vertically when recording instead of horizontally. If you look at the bottom image on the left above, you can see how these vertical videos are then filled in with a lot of black space. 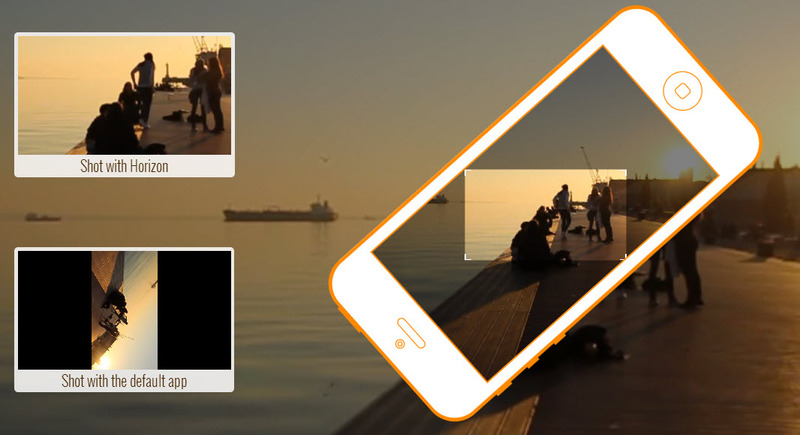 The Horizon app fixes all of that black space by rotating the video, and zooming in, so that no matter how you hold your phone you will always get a perfect shot in. I didn’t think that the videos this app shoots will be stable while rotating the phone, but it actually does keep videos stable. I suspect that the developers have a special program running in the background that stabilizes videos because the end-result is amazing. While testing the app I rotated my phone 720+ degrees and then watched the footage. It was hard to tell when I was rotating the phone and when I was keeping it still. The stabilization is just too good! On top of nailing horizontal video shooting and stabilization, this app also offers an array of filters. The interface of Horizon is really great and so are the features. I mean, this has got to be a great app for me to review it on a Tuesday instead of Friday or Saturday! Take my word for it, this app is really worth it. It seems that filters can only be applied to videos while you’re recording. So if you record something without a filter you can’t add one later. I think that’s a bit silly, even though not “life-threatening” to my use of the Horizon app. Hopefully the developers will add this feature. Rated: 4 by 325 customers.